Notes: These covers are printed on the finest quality linen textured paper and are then lovingly hand made into envelopes. 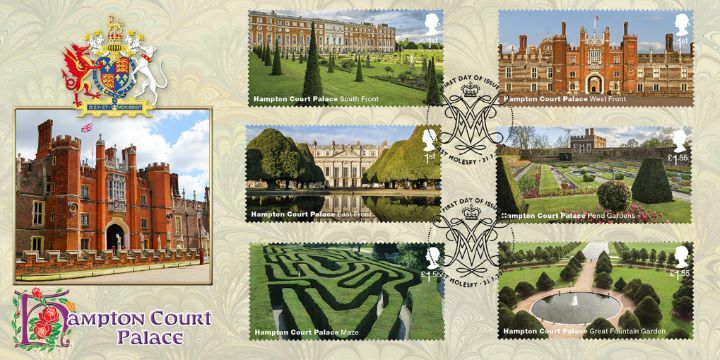 The above Royal Mail Hampton Court stamps were issued on 31 July 2018 by Royal Mail and feature the following stamp designs: 1st South Front; 1st West Front; 1st East Front; £1.55 Pond Gardens; £1.55 Maze; £1.55 Great Fountain Garden. The West Front first day cover with the East Molesey, William III & Mary II's initials, Special Handstamp postmark has been produced by Bradbury and features these stamps which can make a very collectible and lovely gift.